The Gold King Mine spill last summer opened a Pandora’s Box of questions and ensuing research about water quality and the health risks of mine drainage. Local environmental groups have been immersed in testing water, soil and plant samples, while others have dedicated or continued efforts toward inactive mine cleanup ever since a Environmental Protection Agency-contracted company triggered the release of 3 million gallons of contaminated mine sludge into the Animas River on Aug. 5, 2015. Though the heavy-metal plume, which originated at the mine portal 10 miles north of Silverton, has come and gone, unknowns linger in the riverbanks, groundwater and surface water. These unknowns are under scrutiny by Fort Lewis College students and faculty, who have conducted studies, some ongoing, and designed projects formed around better understanding the Gold King spill. Gianniny and Cynthia Dott, a biology professor, have led a groundwater and riparian monitoring project at the Oxbow Preserve since the spill. A “gap analysis” subgroup of the Animas River Community Forum, a local stakeholders group formed post-Gold King spill, has been working on identifying the missing data sets, or “gaps,” in knowledge about the short-term and long-term impacts of heavy metals on water quality. Gianniny, Dott and their students are collecting their own data on river health to contribute to the analysis team’s efforts. Callie Cole, assistant professor of analytical chemistry, has incorporated heavy metal studies into her courses, particularly for her upper-division instrumental analysis laboratory. Using water samples taken from Rotary Park by Mountain Studies Institute after the spill, her students are using atomic emission spectroscopy, a method of chemical analysis that can quantify the presence of an element. 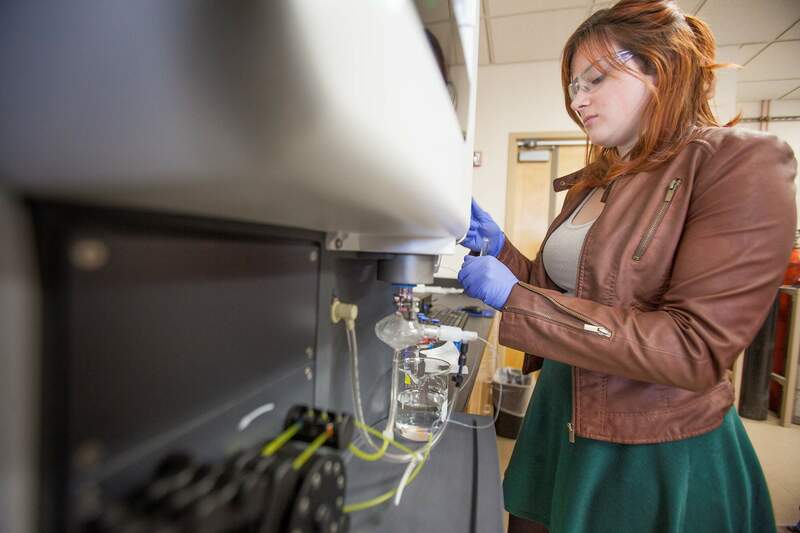 Students Evita Martin and Madeline Memovich are in the middle of a long-term project to identify the most efficient method for determining metal levels, and are working with a MP-AES system, a different model than the one the EPA uses. “As scientists, we want to confirm the EPA’s results,” Memovich said. “We want to understand this for ourselves, and see how the river is affected by changes in temperature, pH and how these chemicals are transported,” Martin added. Other students broke down the EPA’s sediment data sets and made them digestible by creating animated visual components in Lauren Heerschap’s geology course. And Jade Button, a geosciences student, took her research beyond Durango, conducting a groundwater dynamics and riparian aquifer study at the Aztec Ruins. Button said she doesn’t know if the technology she’s using will detect contaminants, but her research could reveal how riparian vegetation is affected by river water infiltrating adjacent aquifers. 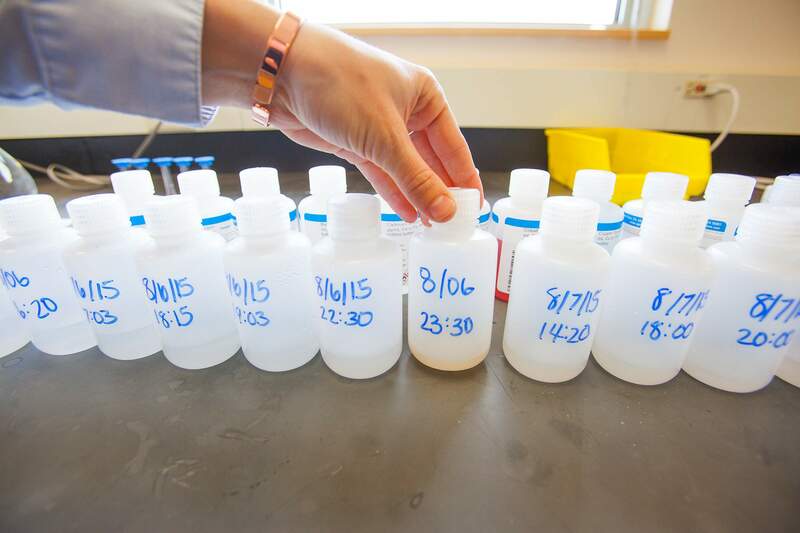 The Fort Lewis engineering department has focused on the tools with which to analyze contaminants. This semester, Physics and Engineering Department Assistant Professor Ryan Smith’s design engineering class developed five cost-efficient devices that can produce spatial and temporal data on snow depth, soil moisture and water quality. Field testing began in mid-March. Gold King also inspired several courses with a concentration on mines and river health, including Heidi Steltzer’s upper-division ecological sustainability course focusing on monitoring methods, and Cathy Hartney’s sophomore honors course that engages faculty from different departments, guest lecturers and community groups to provide wide-ranging perspective on the river and promote discussion. Colorado Parks and Wildlife biologist Barb Horn, who helped organize a data analysis team as a subgroup of the Animas River Community Forum, said the group has opened the door for students to contribute their own research and get first-hand knowledge about what data sets are still missing. Professors agree: Localizing education creates relevance and better engages students, whose projects will not necessarily produce new information. But by sharing information, their research can contribute to a conversation and the bigger picture. “When I have my students working on projects, I try to find ways we can collect data that might be useful to Colorado Parks and Wildlife, the city of Durango or watershed groups,” said Dott, who taught a river ecology course last semester that took many of its lessons from the Gold King spill. FLC Gold King Projects Fort Lewis College Chemistry students conduct tests on water samples taken from the Animas River during the Gold King Mine spill. 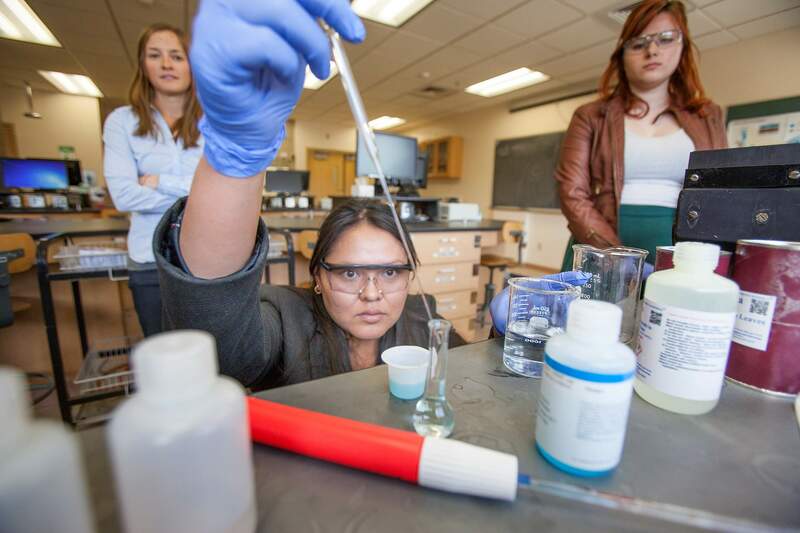 Fort Lewis College Chemistry students conduct tests on water samples taken from the Animas River during the Gold King Mine spill. Fort Lewis College senior Evitas Martin analyses samples of water taken from the Animas River during the Gold King Mine spill as part of a class to study long-term impacts of heavy metals on water quality. Fellow student Madeline Memovich, right, and Assistant Professor of analytical chemistry Callie Cole, left, observe. Fort Lewis College senior Madeline Memovich prepares to test water samples taken from the Animas River shortly after the Aug. 5, 2015, Gold King Mine spill. Callie Cole, assistant professor of analytical chemistry at Fort Lewis College, inspects samples of water taken from the Animas River shortly after the Aug. 5, 2015, Gold King Mine spill.